Sealife - Sets 4 Set of 4. 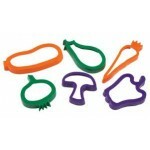 Colourful 'cookie' style cutters that are great for doughs, plasticine and clay. Make wonderful creatures with these varieties. Hang-sell packaging. ..
Dinosaurs - Sets 4 Set of 4. Colourful 'cookie' style cutters that are great for doughs, plasticine and clay. Make wonderful creatures with these varieties. Hang-sell packaging. ..
Farm Animals - Sets 4 Set of 4. Colourful 'cookie' style cutters that are great for doughs, plasticine and clay. Make wonderful creatures with these varieties. Hang-sell packaging. ..
Fruit - Set 6 Set of 4. Colourful 'cookie' style cutters that are great for doughs, plasticine and clay. Make wonderful creatures with these varieties. Hang-sell packaging. ..
Garden Bugs - Sets 4 Set of 4. Colourful 'cookie' style cutters that are great for doughs, plasticine and clay. Make wonderful creatures with these varieties. Hang-sell packaging. .. 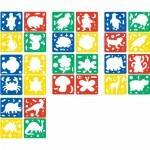 Jungle Animals - Sets 4 Set of 4. Colourful 'cookie' style cutters that are great for doughs, plasticine and clay. Make wonderful creatures with these varieties. Hang-sell packaging. .. Vegetables - Set 6 Set of 4. Colourful 'cookie' style cutters that are great for doughs, plasticine and clay. Make wonderful creatures with these varieties. Hang-sell packaging. ..